Sorting - Day 2 - . I'v just gotta ask - what is their method of sorting? By color? By size? By shape? By at-at? Because all our legos are in one big bin partying together. Yes. Definitely smaller. And you know- men do love a project. What are they going to do when this one is over? Add a new wing to the house? Looks quite a bit smaller. I wish them luck! I don't know about smaller. Jeff looks bigger. I am of the opinion that this needs to happen at our house. But my Lego builders are against it. I don't understand - who wants to search through a ginormous tub of legos to find that little translucent yellow piece to make the perfect headlight? I could sort it myself, but if I don't have the boys on board, my work will be for not within a week. At any rate, I am jealous and curious as to how your project "sorts" out. HA! I'm just glad I live in a Lego free environment. But, having Bob and Jeff is worth it. I had an encounter with Barbie shoes that looked very similar to this. Then I became smart and just threw away the shoes (because they never stay on anyway). 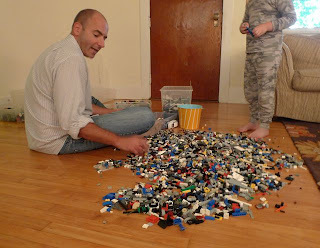 I'm kind of secretly hoping my son will hate Legos... because you can't just throw away the Legos from the Lego set. I'm going to need How To Handle Your Child's Legos training. we have a hand me down lego table. handed down from kai. kai has a lego ROOM now.